PARIS (AP) — The same France side which dominated Scotland will take on Ireland on Sunday in Dublin in Six Nations rugby. 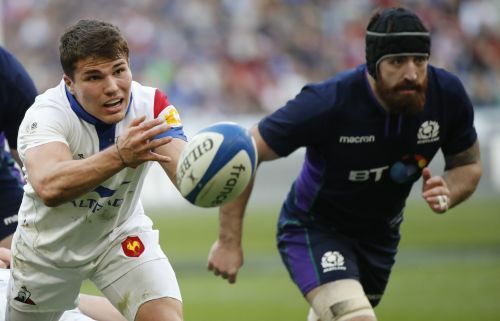 After chastening defeats to Wales and England, France was fizzy two weekends ago in beating Scotland 27-10 and maintaining a 20-year unbeaten record at home against the Scots. On Tuesday, coach Jacques Brunel retained halves Antoine Dupont and Romain Ntamack, the teammates at Toulouse who paired up for the first time in a test, and successfully. Thomas Ramos also stayed at fullback, with goalkicking duty. The French go to Ireland, where the home side, the defending champion, has yet to rediscover its groove from 2018. Ireland followed a thumping from England with shaky wins over Scotland and Italy. France last beat Ireland in 2016, and last won in Dublin in 2011. France: Thomas Ramos, Damian Penaud, Mathieu Bastareaud, Gael Fickou, Yoann Huget, Romain Ntamack, Antoine Dupont; Louis Picamoles, Arthur Iturria, Wenceslas Lauret, Felix Lambey, Sebastien Vahaamahina, Demba Bamba, Guilhem Guirado (captain), Jefferson Poirot. Reserves: Camille Chat, Etienne Falgoux, Dorian Aldegheri, Paul Willemse, Gregory Alldritt, Baptiste Serin, Anthony Belleau, Maxime Medard.